Our Fall 2011 Private Pilot Ground School visited the NCDOT Division of Aviation and the Raleigh AFSS at RDU on Wednesday, November 2, 2011. 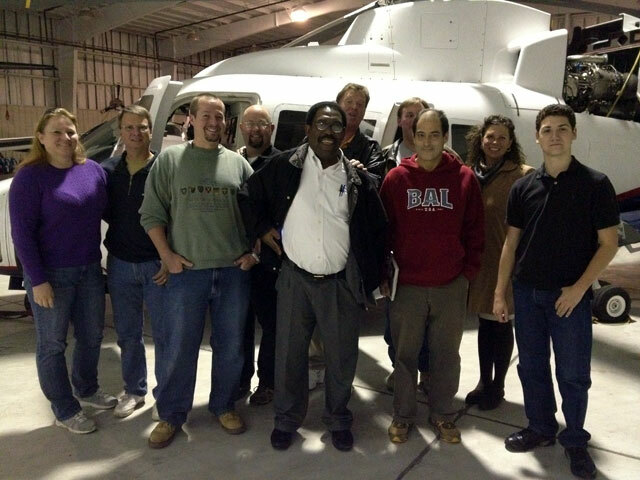 After a presentation and tour of the NCDOT hangar, the group headed over to the FSS building. “A flight service station (FSS) is an air traffic facility that provides information and services to aircraft pilots before, during, and after flights, but unlike air traffic control, is not responsible for giving instructions or clearances or providing separation. The staff who communicate with pilots from a FSS are referred to as specialists rather than controllers, although in the U.S., FSS specialists’ official job title is Air Traffic Control Specialist – Station.” These are the people we speak to either on the ground when getting a weather briefing, or in the air when filing, opening, and closing flight plans. Many thanks to Tom Freeman, Aviation Safety and Education Specialist at the NCDOT Division of Aviation, and Bill Hall, Manager, Raleigh Flight Service Station for their time and hospitality.